It looks pretty good, but there are definitely a few things I need to fine tune. For example, I need to center the text on the spine a little better. 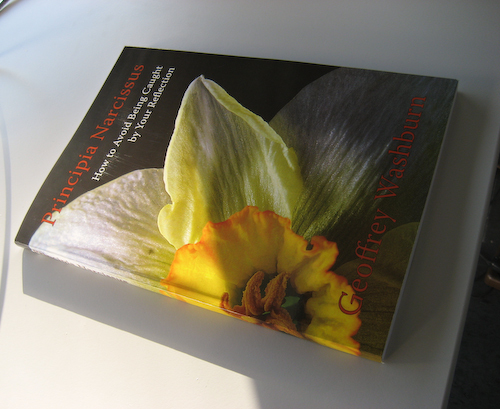 Update: If you clicked through to Flickr, you would have seen my comment on it, but just in case, I should thank Tim Lindenbaum for kindly permitting me to use his daffodil photograph as the basis for the cover. Wow, that’s beautiful. I’m going to have to try Lulu for something now. Even if I’m the only one who buys it. 🙂 I’m curious whether you composited the cover/spine yourself… or if you upload image and text separately and they do it. Looks like it’s shadowed a bit. @Alan: That is very kind of her (and you), thanks! @Chris: I composited the cover myself using Inkscape (which is definitely not as good as having Illustrator available…). Lulu has a cover »wizard«, which is okay for simple things, or they can calculate for you, based on the number of pages in your book, how large the spine will be. You can then upload a single PDF with the back cover, spine, and front cover as one image. Yes, I probably should have photographed the book with slightly more consistent lighting.